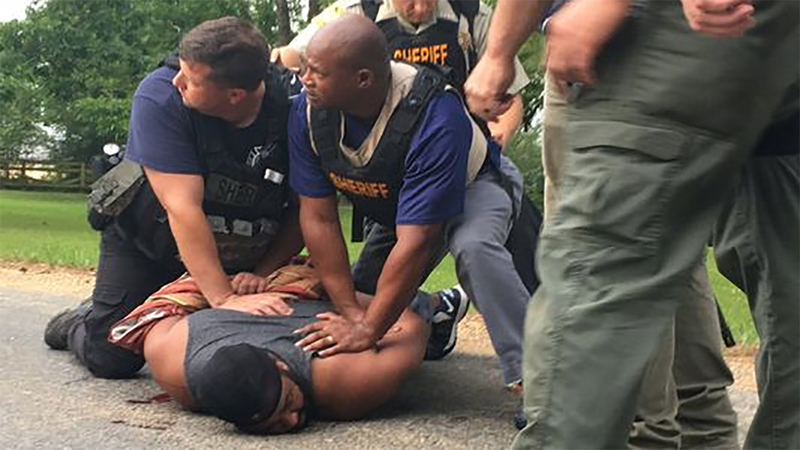 BROOKHAVEN, Mississippi -- Authorities in Mississippi said Sunday that a suspect is in custody after eight people were killed in a shooting, including a sheriff's deputy. Strain said charges have not yet been filed against the suspect, who was arrested in Brookhaven, and that it would be "premature" to discuss a motive. "I ain't fit to live, not after what I done," Cory Godbolt told The Clarion-Ledger after his arrest. The newspaper recorded video of the suspect talking as he sat with hands cuffed behind his back on a roadside surrounded by law enforcement officers. "I was having a conversation with her stepdaddy and her mama and her, my wife, about me taking my children home," the suspect says on the video. "Somebody called the officer, people that didn't even live at the house. That's what they do. They intervene. "They cost him his life," the suspect said, apparently in reference to the slain deputy. "I'm sorry." "My intentions was to have God kill me. I ran out of bullets," he said. "Suicide by cop was my intention."" Gov. Phil Bryant issued a statement asking state residents to pray for the victims. He also noted the "sacrifice" made by law enforcement officers to protect and serve their communities. "Every day, the men and women who wear the badge make some measure of sacrifice to protect and serve their communities. Too often, we lose one of our finest. I thank the law enforcement agencies involved for their hard work," Bryant said.